Solar wind flowing from this coronal hole could reach Earth on March 19-20. Credit: SDO/AIA. Metallic photos of the sun by renowned photographer Greg Piepol bring together the best of art and science. Buy one or a whole set. They make a stellar gift. GEOMAGNETIC STORM WARNING: A fast-moving CME that left the sun on March 15th is expected to strike Earth's magnetic field on March 17th. NOAA forecasters estimate a 70% chance of polar geomagnetic storms when the cloud arrives. Aurora alerts: text, voice. "It is visible also in two or three other image stacks," says Rosen. He notes how the stars in the image are trailed, but the apparent fragment is not. "It seems to follow the comet, not the stars. 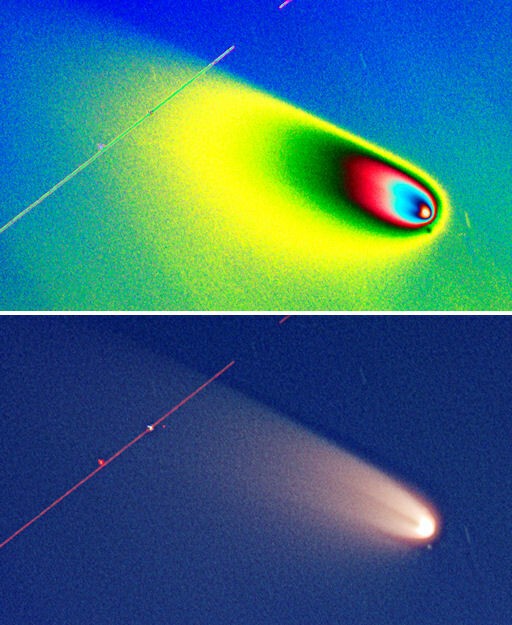 A plane passed through the field of view during the exposure, making a red streak through the comet's tail." "The colorful image is a frequency modulation that increases the contrast and clearly shows the fragment as a dark dot below the nucleus," he continues. "I hope this splitting can be confirmed or refuted soon by other observers." For casual sky watchers: A growing number of people are reporting that they can see Comet Pan-STARRS with the naked eye. Best estimates place the magnitude of the comet at +0.2, about twice as bright as a 1st magnitude star. As the comet moves away from the sun, its visibility is improving, which means you might be able to see it in the nights ahead. Step outside about an hour after sunset and look west: sky map. More: NASA video, 3D orbit, ephemeris, light curves. 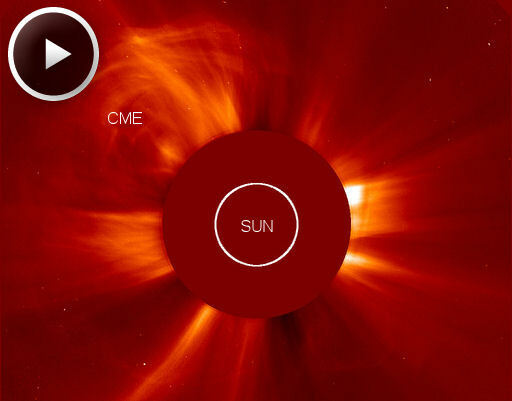 The CME left the sun traveling some 900 km/s (2 million mph). Three-dimensional computer models based on observations from SOHO and NASA's twin STEREO probes predict the CME will cross the void between sun and Earth in two days or less. NOAA forecasters estimate a 70% chance of polar geomagnetic storms when the cloud arrives on March 17th. This means the sky could turn green on St. Patrick's Day! High latitude (and possibly even middle latitude) sky watchers should be alert for auroras this weekend. Aurora alerts: text, voice. On March 16, 2013 there were 1384 potentially hazardous asteroids.